Aldridge Lodge is one of Ireland’s hidden gems. 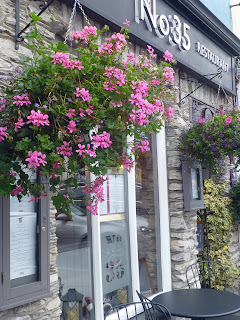 A top class restaurant, with a Michelin bib since 2007, in rural surroundings just outside of the Wexford village of Duncannon (with its Kennedy family connections). 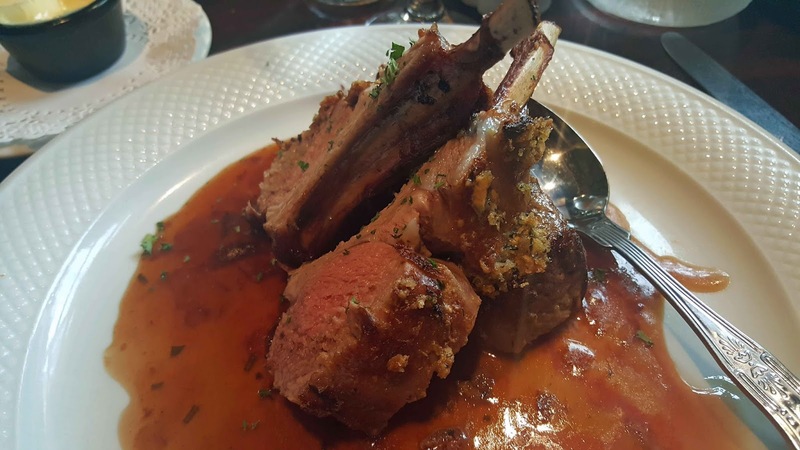 Amazing food here and, hidden or not, you’ll be well advised to book well in advance. Even more so if you want one of the three rooms on offer. The beautiful spacious rooms are very much in demand and I’m told that groups make annual dates here. 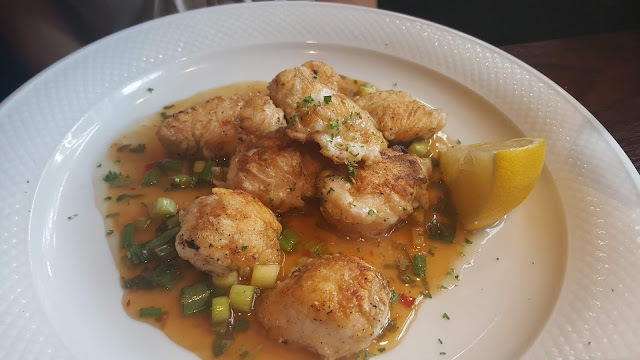 They enjoy a great meal, at very reasonable prices, and then take a bottle or two of wine upstairs, where there is a very comfortable common room, and chat into the night. Aldridge Lodge may in a secluded part of County Wexford but you won’t feel isolated here as the marvellous Hook Head Peninsula is just a short drive away - you may visit the lighthouse, the haunted Loftus Hall, Tintern Abbey and its 200-year old Colclough Gardens, and Ballyhack and its castle, and so much more. Billy Whitty and Joanne Harding are the owners here and the welcome is warm. Chef Billy met us as we parked and helped bring in the cases and invited us to come down for dinner at our leisure. And it is leisurely, no rush, but no delays either! First you are brought into the bar area. The menus are brought as you sip your drink - I enjoyed their special Aldridge “G&T”! They don’t have a spirits licence so the special “G&T” is based on white port. Delicious! The choice for the 35 seater restaurant is fantastic, almost totally local. Billy’s family are involved in fishing and farming in the area and are the main suppliers. They have a Tasting Menu for just €35.00. 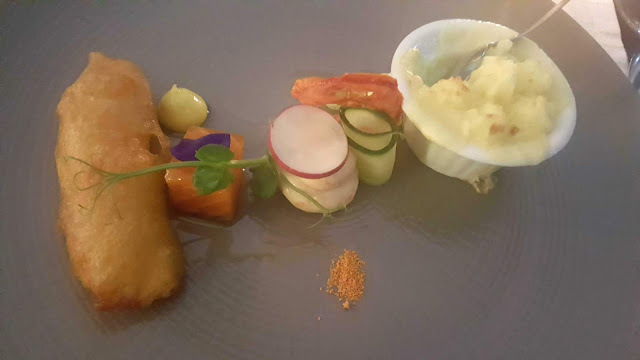 After an amuse bouche in the lounge, you move into the dining room and do watch out for a superb starter, the Duncannon Tasting Plate: Tempura smoked salmon, smoked salmon mousse, smoked sea trout and a divine smoked haddock fish pie. 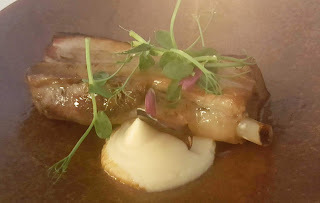 The Middle Course may offer Twice cooked free-range pork belly rib with celeriac purée, soya and honey jus. Or Seared Kilmore scallop with Gubbeen chorizo croquette and creamed cauliflower. Each terrific. If you are there in winter-time, it is probable that venison will feature. 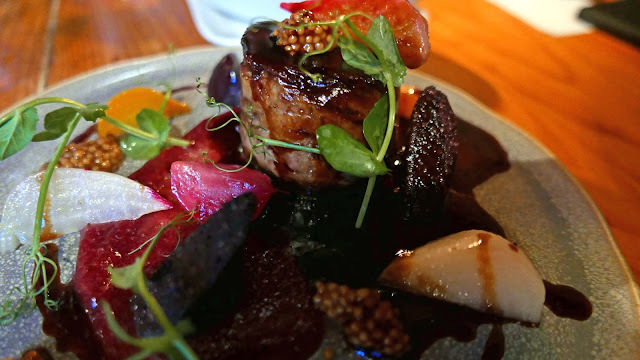 I certainly enjoyed the Venison haunch and loin with a black pudding cake and tomato. CL’s choice was also superb: Glazed Free Range Chicken Breast with spiced sprouts, cranberry compete, roast baby parsnips, golden raisins, almonds and pan juices. Desserts are also rather special. Ours were Raspberry Tiramisu and a Vanilla Crême Brulée with honeycomb. 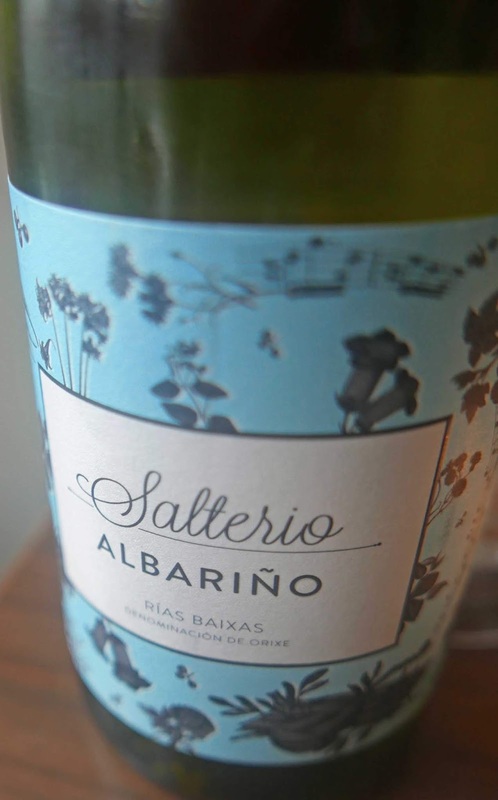 There’s an interesting and wide-ranging wine list, also a selection of ports and dessert wines. Quite a few available by the glass. We finished off with one of their specials: a glass of the delicious Stonewell Tawny. They also have local beers, mainly from the Cleverman range. After a good night’s sleep, we woke to see the December sun shining over Duncannon before heading down to the same room for breakfast, another five star event, again with Billy in the kitchen and also front of house! We didn’t go for the Full Irish, but rather the Full Fish! 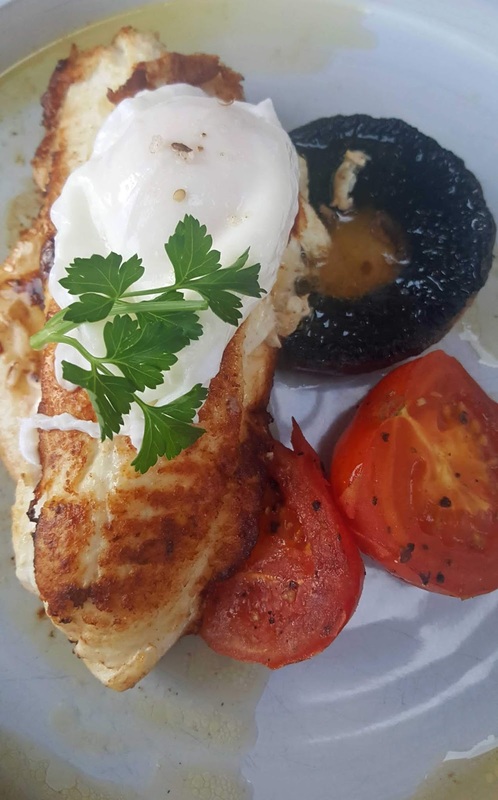 Let me give you a few details; the magnificent plate came with plaice fillets, reinforced with a poached egg (choice of hen or duck), tomatoes and a Portobello mushroom. All that after some terrific starters including Pear poached in red wine and a Yogurt pot with hazelnuts and raspberry. That set us up for the day, for sure. Time then for a leisurely chat with the chef/owner before we struck off to Ballyhack to begin the journey home with a short ferry trip to Passage East, all the while promising ourselves we’d be back! 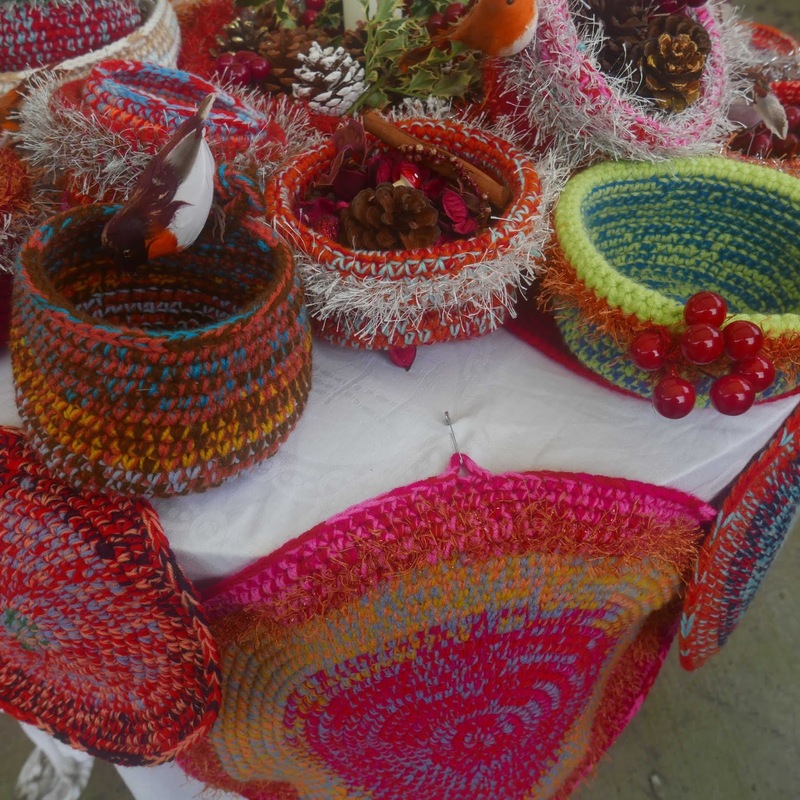 It may have been wet and windy outside the City Hall last Friday evening but inside there was a sunny positivity around the stalls. Beara Gin are exporting to the continent; Joe’s Farm’s new Potato Crisps are going very well; Longueville House ciders have had an excellent year; Kinsale Mead and Stonewell Cider also speak well of their 2018 experiences. 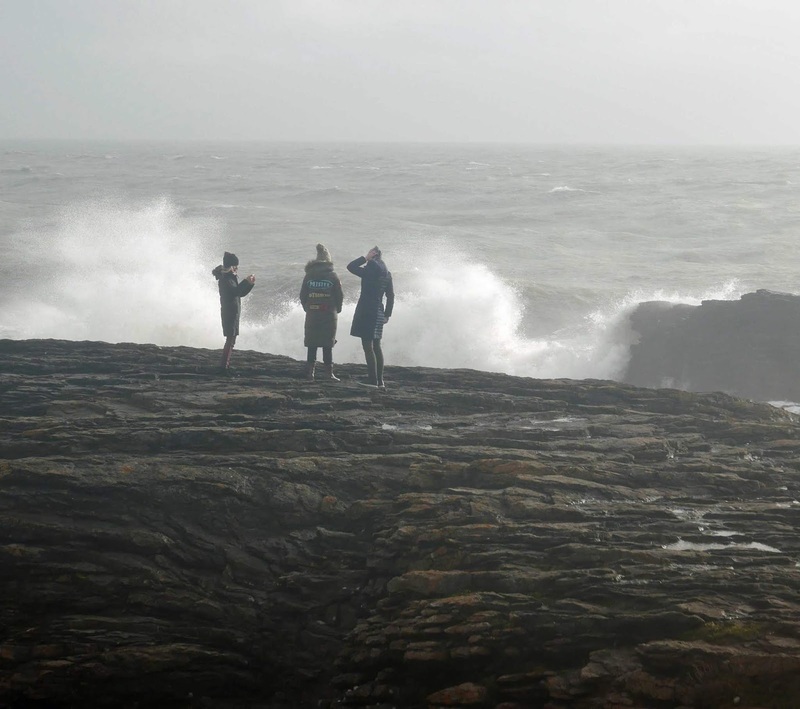 Beara Gin are relative newcomers, just over 12 months in existence. But they are making their mark in the competitive Irish market and Brand Manager Peter White told me they are already exporting to Germany, Poland and Denmark. A pallet has just been dispatched to France and they are now working on Italy. 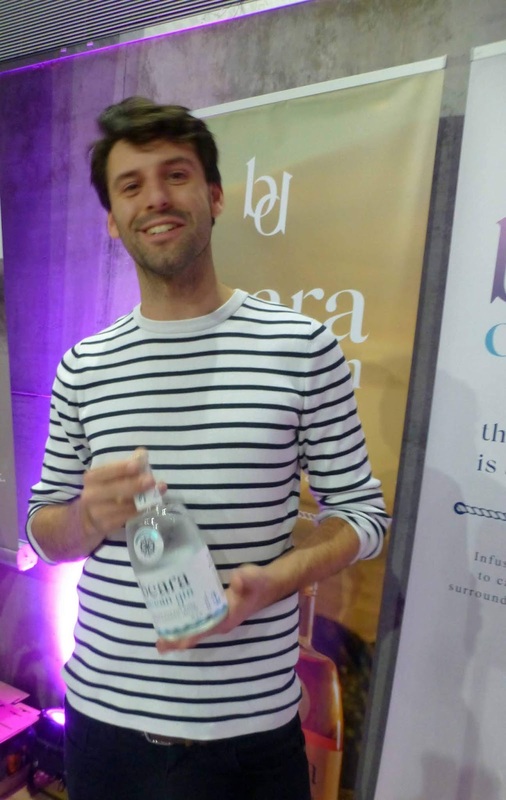 Getting into a new export market takes patience and time so best of luck to Peter and all at Beara Gin whose gins are infused with salt water and sugar kelp. They have two gins on the market, the original Ocean Gin and their Pink Ocean Gin (here the addition of Cranberry and Rosewater adds the pink hue). Rupert Atkinson, the smiling face of Longueville Beverages, reported an excellent year, particularly the last six months. 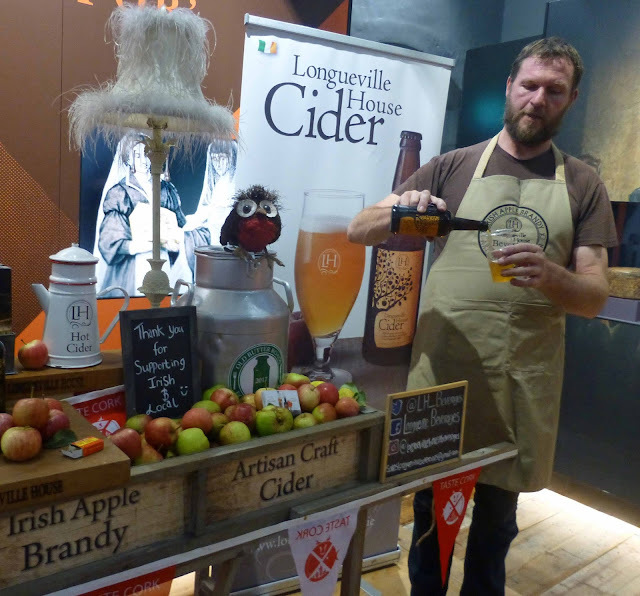 “The hot weather sent cider sales flying and the fact that it is available in O’Brien’s was also a big factor.” Longueville normally have lots of apples for sale but not this time as stocks of cider and apple brandy have to be replenished. Stonewell are another top local cider-maker and they are known for their innovation, both summer and winter. Their winter offering this year made its debut in the City Hall. 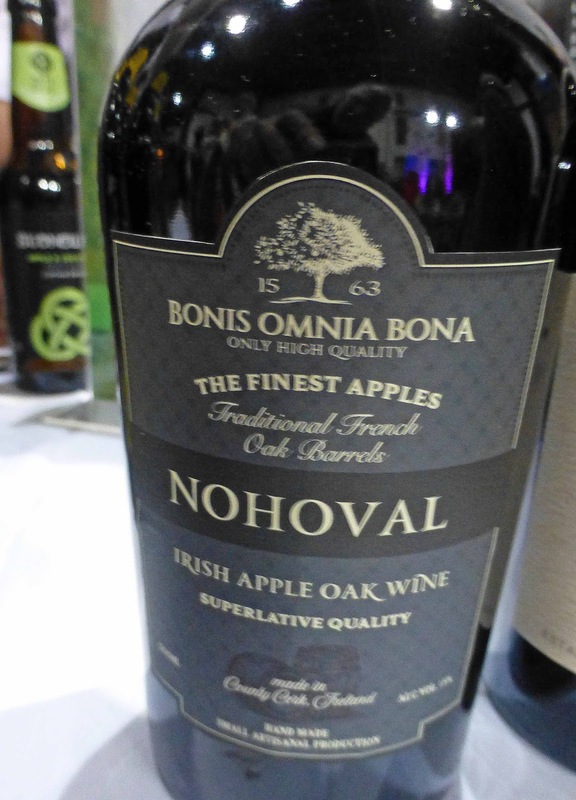 It is a Nohoval Irish Apple Oak Wine, the finest Irish apples raised in traditional French casks. Superlative is mentioned on the label. I couldn’t argue with that! 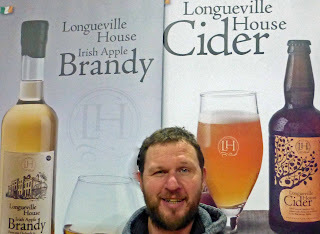 And speaking of innovation, Denis and Kate of Kinsale Mead were right alongside. 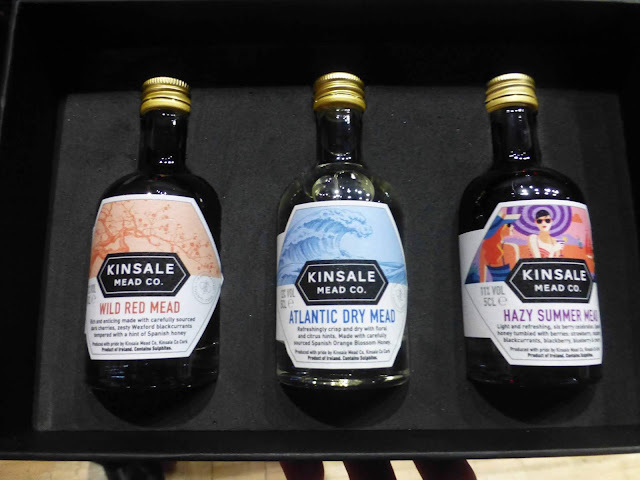 Kate showed me their gorgeous gift pack of three miniatures, a wee bottle each of Hazy Summer Mead, Wild Red Mead and Atlantic Dry Mead. Not just a package; it is delightfully illustrated with the story of mead. Worth a look. By the way, if you want some of that Hazy Summer, you’ll need to act fast. “That went very well for us,” Kate said and stocks are fast running down. 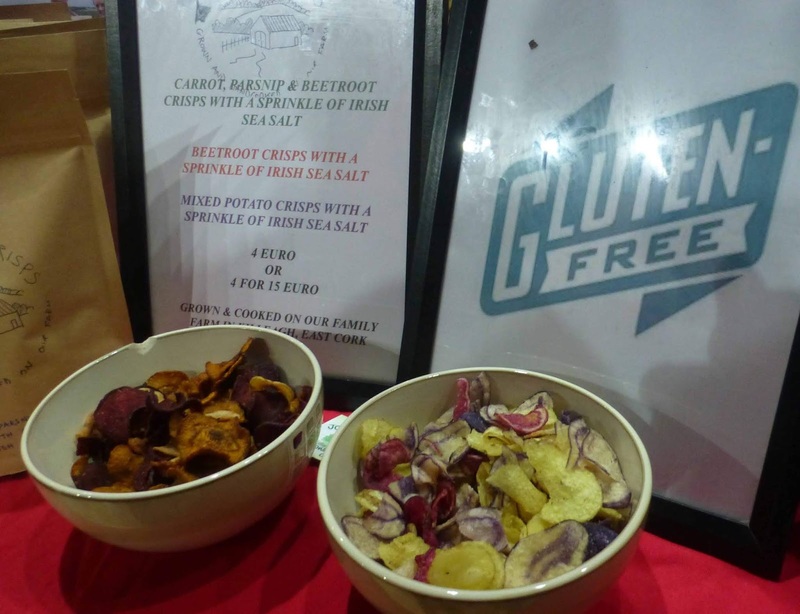 Sandra Burns of Killeagh, whose Joe’s Farm vegetable crisps have become a favourite over the past couple of years, was delighted with the reception the new Potato Crips have received over the past year and said they flew out the door during the Ploughing Championships. Husband Joe is a big fan of the new crisps (a mix of colours), all made at the family farm in Ballycurraginny. 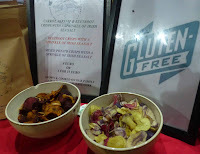 Both the vegetable and potato crips are widely available, including SuperValu. Recently, they had a pumpkin picking day on the farm and were inundated when they put out a call for pickers, individuals and schools among the volunteers. Sandra was delighted with the schools as it turned the day into an easy going food education event. See more about it here on their Facebook page. I think I’ll have a few Tastes of the Week from that lot in future posts on the blog. No 35 Kenmare. It’s A Good Number! When they say Farm to Fork in No. 35 Kenmare, they mean exactly that. Their free range pigs are reared just about a mile away. And they don't have to go too far for their fish either! We were there on a damp Tuesday night recently and the place, spread over two floors, was packed. A terrific buzz there and terrific food too from Head Chef Tony Schwarz and his team in the kitchen. The team outfront were excellent too, helpful and chatty, and efficient to boot. Luckily we had a reservation and were soon seated upstairs (those stair steps are very narrow by the way). I was aware of the pig farm so was concentrating on that on the menu as we nibbled at the excellent Treacle and Walnut bread that came with a seaweed butter. 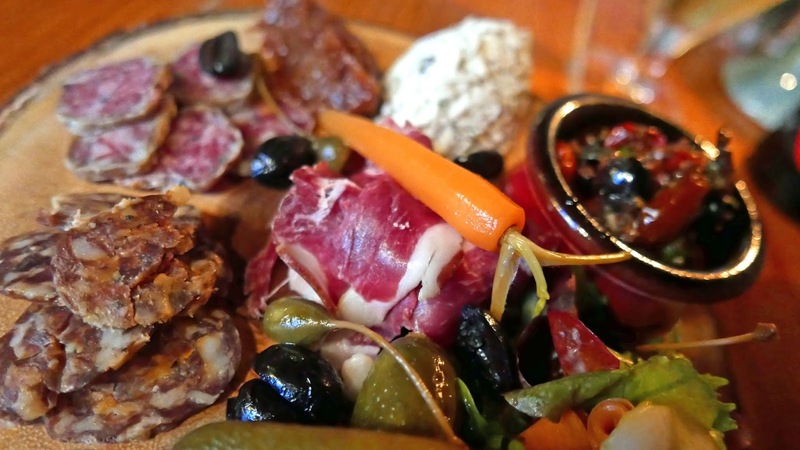 I spotted my starter without delay: a charcuterie plate of salami, chorizo and coppa along with various relishes and gherkins, pickled cucumber, Granny’s jam, olives, celeriac with mustard, capers, peppers. It was packed with good things, substantial and totally delicious. CL was a little on the jealous side but I was able to share a few bits and pieces! Her starter was the Dingle Gin Cured Salmon, Cucumber: Ketchup & Soused & Charred. Not as substantial maybe but another excellent appetiser. 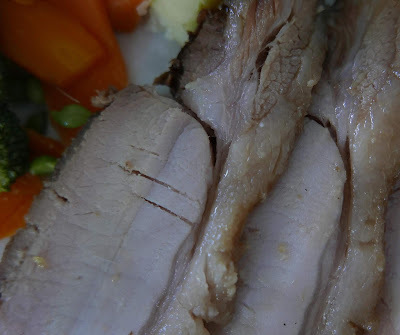 Cider and pork is always a good match so I was enjoying a glass or two of the lovely Stonewell Medium Dry. And I needed another one as my mains arrived. They do a Pork dish of the day and I tucked into the Collar of Pork, with colourful Mooncoin Beetroot, the excellent smoked black pudding, all in a red wine jus. A super plateful, great flavours and textures, aromas too. CL got a lovely piece of Halibut, well cooked and neatly presented, served with summer vegetables, a basil pesto and red pepper relish. Have to admit though, we didn’t make it to the desserts this time! It was a wet night, the last Tuesday in August, and we were not expecting to find so many in the pubs. But most were packed and most had live music. We finished the evening enjoying the craic, sipping a craft beer or two (Brú Pale Ale and the Tom Crean family Expedition Red Ale). 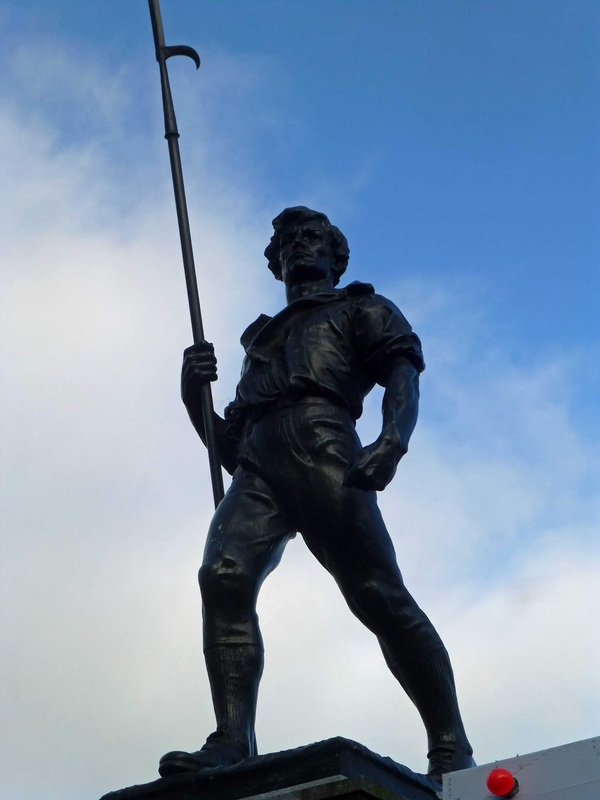 Kenmare Abú! 35 Main Street, Kenmare, Co Kerry. As we walk up the stairs to our Bantry restaurant, the multi-event A Taste of West Cork festival is in full swing, heading for its closing weekend. 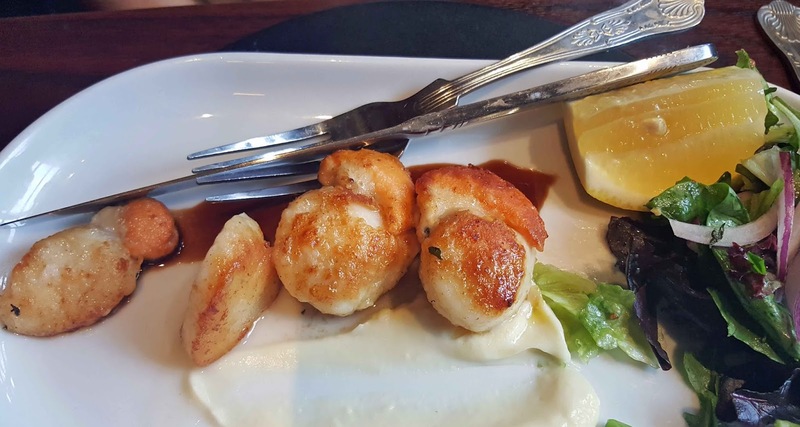 Many attractive food options around the towns and villages but knowing punters make their way to the Fish Kitchen and a packed house enjoys the best produce from the local shores and seas. The Kitchen crew are busy but not a bother as the delicious meal is served. “Freshness, simplicity, quality” is what they promise here and that is exactly what we get. Excellent service too, a good choice of wines and craft beer and good company too at the long tables. We enjoy the chat with Esther and Joe from Cappoquin and Jim and Barbara from the town. 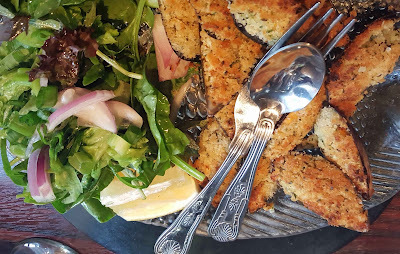 Diarmaid, who owns and runs the Fish Kitchen with his wife Ann-Maria, served us a simple Amuse Bouche, a sharing plate of Sheep’s Head periwinkles with garlic. Hard to get them out of the little shells but well worth the effort! Next up was a trio of Smoked Salmon, Prawns and Oyster. Tasty stuff. 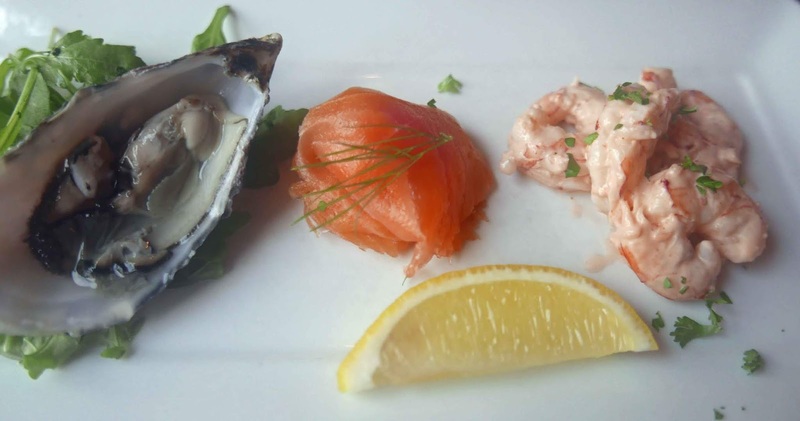 Excellent salmon, amazing prawns from the bay outside and a superb Carlingford oyster. Quite a hat trick of flavours. 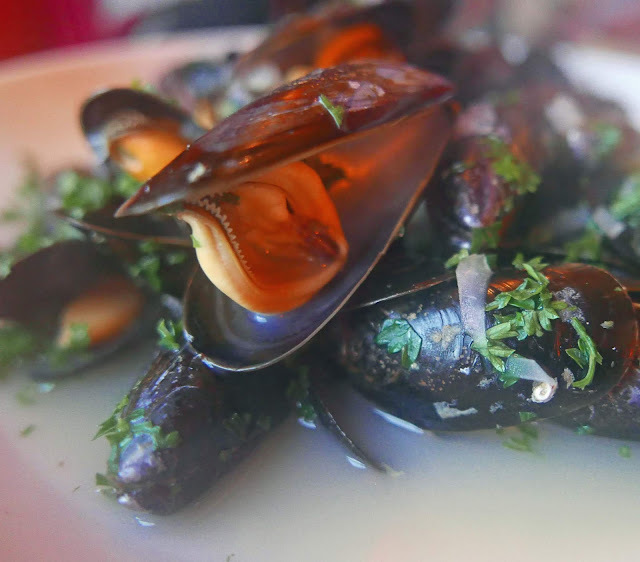 We were very happy with that and got even happier with the next round: Steamed Bantry Bay mussels with Stonewell Cider. 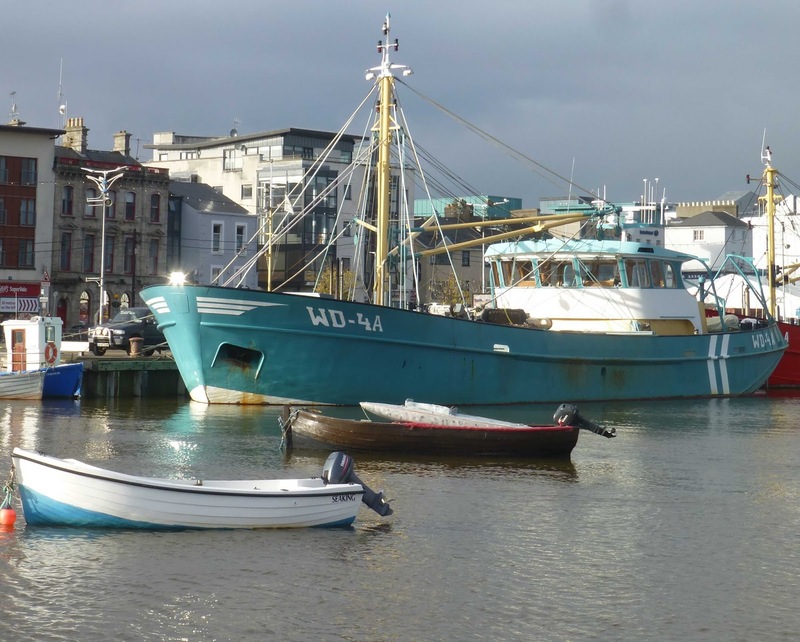 We had been out on the bay earlier and had seen the lines and lines heavy in the water with rope-grown mussels. And here they were now on our plate, meatier and tastier than any I’ve tried in recent times. 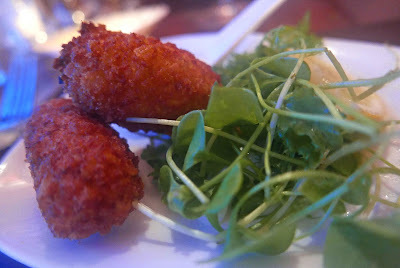 Another course was on the way as the Salterio Albarino level in our bottle was falling and this was another handsome combination: Union Hall Smoked Pollack and crabmeat croquettes, served with a simple salad. 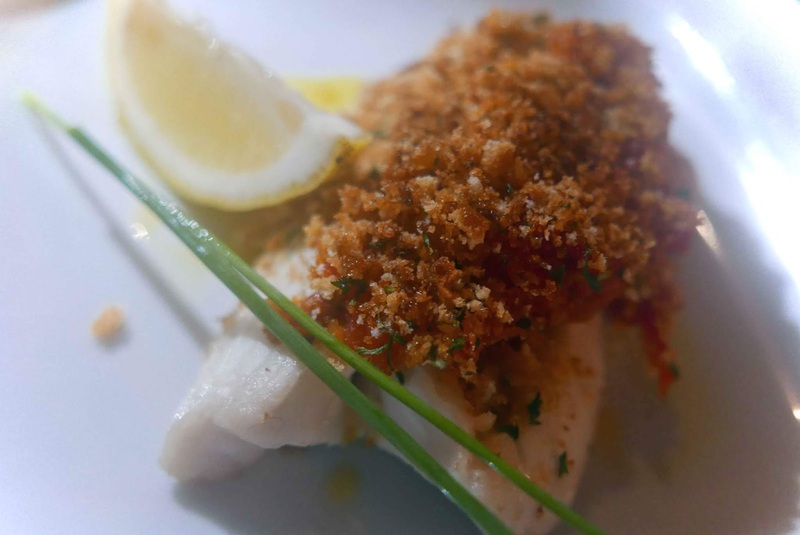 Now for the big one: herb crusted Castletownbere Hake with sun-dried tomato and Gubbeen chorizo pesto. Sometimes in Ireland we smother delicate fish with heavy sauces. Not here. The Hake was the star, the others there just to show it off to perfection. And, yes, it was perfect, as were all the courses. And of course there was dessert. 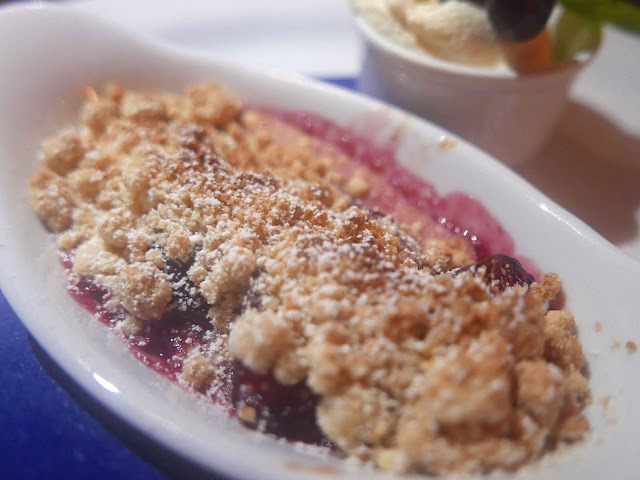 Here we had a choice and the Plum Crumble won hands down at our table; maybe the lavender infused pannacotta found takers at the other tables! While this was a special dinner (we paid 45 euro a head) for the festival, you will get the freshest of fish, skilfully handled and simply presented at a fair price every day, lunch and dinner, at this town centre venue. And, if you are eating at home, then grab some fresh fish from the family market on the ground floor! 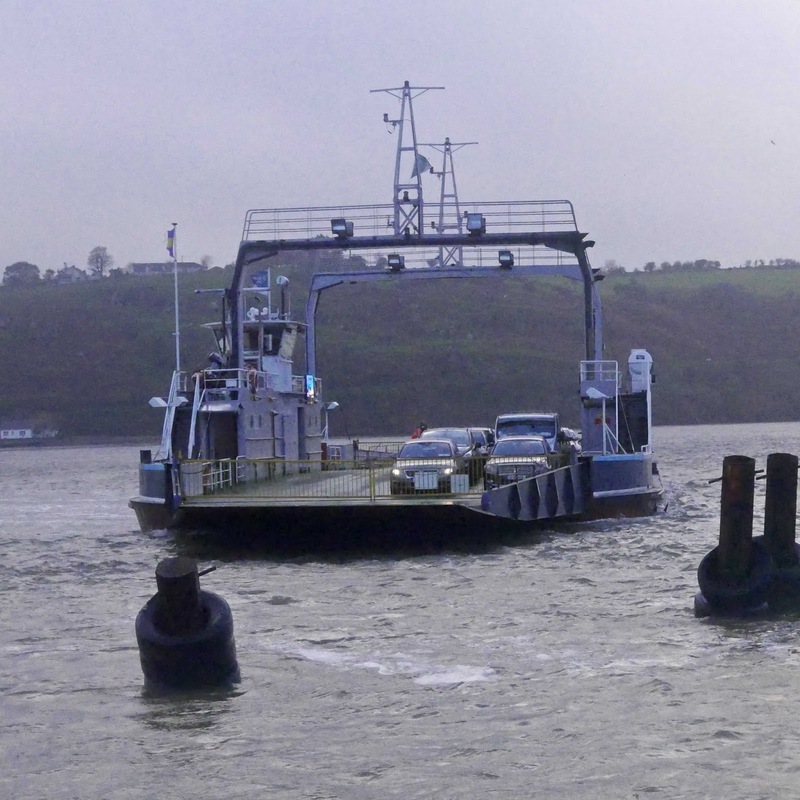 * Diarmaid was our host on our earlier trip around the bay - check it out here. He has been doing it a bit over the past summer and intends to make it a permanent feature next year. A proud native of the area, he is a superb guide to the huge bay, its geography and amazing history. His sturdy rib will take six paying passengers so keep an eye out for that in 2019. I must get over to Bandon and Clonakilty markets more often as these are the only places that I can get Baltimore Bacon, my Taste of the Week. And it will probably be even more difficult to get now as Nathan Wall, who began farming pigs in Baltimore ten years ago, was recently honoured by the Irish Food Writers Guild, an award that is more valued than most an award that is more valued than most as it comes from independent professional writers. After a recent visit to Bandon, I tried Nathan’s Maple Smoked Rashers (also available in joints) at home. The first bite and you just stop, stop talking, stop thinking, such is the amazing flavour. Then you get on and enjoy it. And if those rashers were top notch, the Black Bacon joint was something else. Another must try! This is Artisan Dry Cured Bacon, West Cork pork, Atlantic sea salt, black pepper, molasses, raw cane sugar, spices, natural oak smoke. Another outstanding product from Baltimore. Other Baltimore products are Cider and Apple Smoked Bacon, Cider and Apple Unsmoked bacon, Baltimore Bacon unsmoked and also smoked. And don’t forget his tasty lardons. 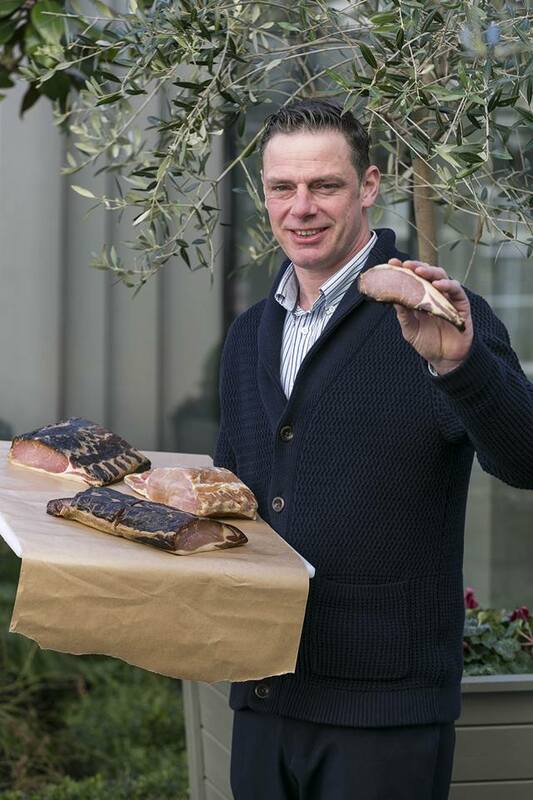 Nathan has had help and input from other artisan producers in the area, particularly from Fingal at Gubbeen where he works part-time and where his products are smoked. At the award celebration dinner in Dublin, the main course was Cider and Apple Smoked Baltimore Bacon with Parsnip Purée, Caramelised Brussels Sprouts and Onions and Fresh Mandarin. And that cider came from Stonewell in Nohoval. A specialist plasterer turned free-range pig farmer, Nathan Wall of Baltimore Bacon began curing his own bacon in 2014. He now keeps over 40 free-range Berkshire pigs on his Baltimore farm and sells produce from his own pigs at the weekly farmers’ markets in Bandon and Clonakilty. 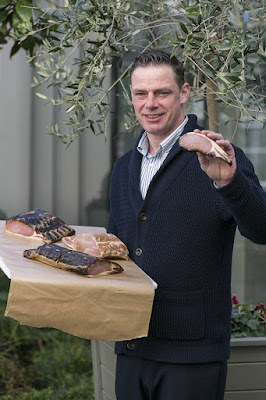 As demand grew, he began sourcing free-range pigs through Our Piggy Co-op run by Fingal Ferguson of Gubbeen Smokehouse and locally reared pigs from Staunton’s in Timoleague for the non-free-range produce that he sells through local restaurants and shops. The range includes smoked and unsmoked bacon and ham, all of which are produced naturally and free from nitrate and additives. Some are simply cured with Atlantic sea salt and raw cane sugar, while the superb dry-cured black bacon is cured with molasses and black pepper. His apple and cider-smoked bacon, available sliced or as a joint, uses Stonewell Cider from a previous IFWG award-winner. The bacon is smoked over hardwood at Gubbeen Smokehouse. Stonewell Seasonal Ciders. Taste of the Week. Taste of the Summer! Stonewell Apple & Cucumber Limited Edition Craft Cider 2017, 5.5%, 330ml bottle. 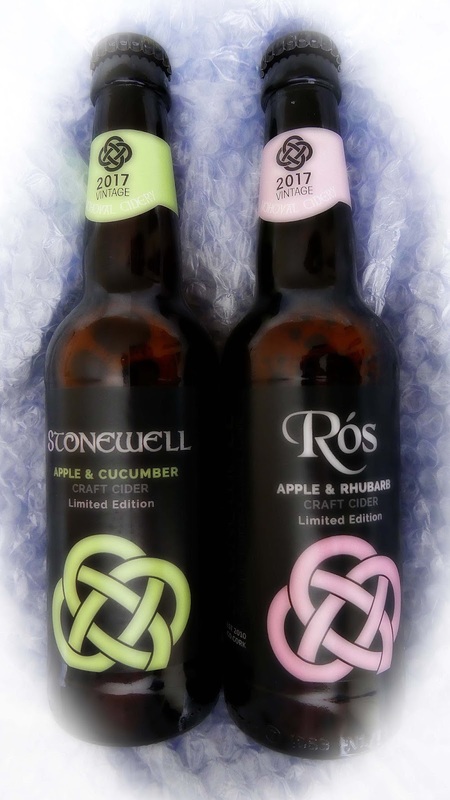 In 2016, Stonewell won the Supreme Champion Award at the Blas na hEireann Awards in Dingle with their Rós, an apple and rhubarb cider, and their current seasonal is this medium dry Apple and Cucumber. First thing you notice is the huge difference in colours, the cucumber one looking more like a white wine (with hints of green), though with lots of bubbles. The cucumber comes through, gently, on the nose and on the palate. Flavours are probably lighter than the Rós but, if anything, are even more refreshing. A light and moreish flavour, as they say themselves, from this combination of Royal Gala apples and a subtle twist of cucumber. The Supreme Champion is an all local amalgam. 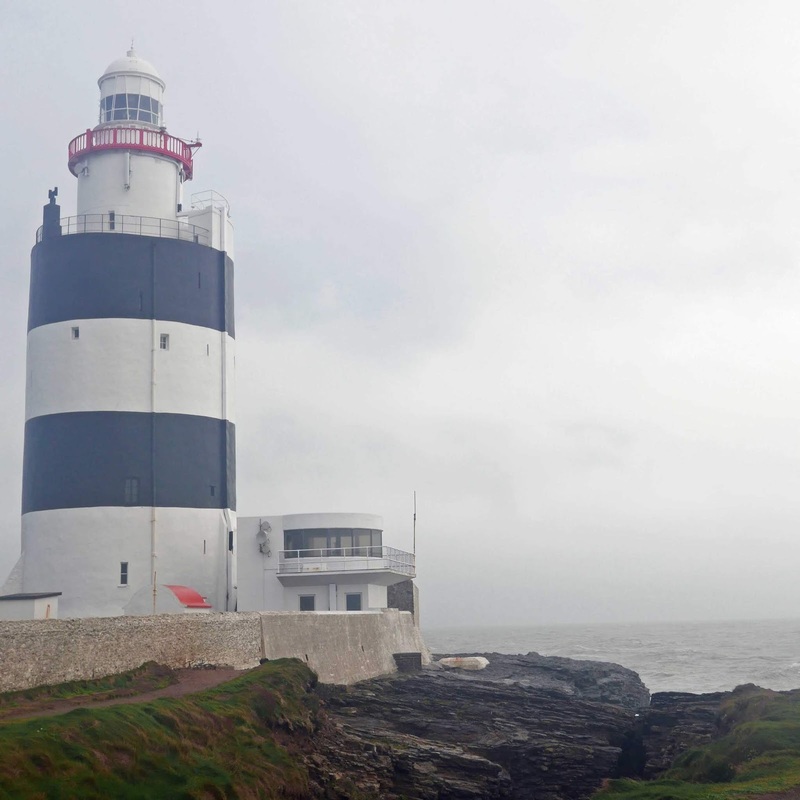 The rhubarb juice is extracted from the produce of Robbie Fitzsimmon’s East Ferry Farm in Cork and blended with the “soft caressing” flavours of the apple juice. This new batch has a gorgeous mid-gold (no pink! ), with fountains of bubbles. Rhubarb comes through on the palate but its tartness is more than balanced by those soft caressing flavours of the apples. An engaging mix indeed from the small but highly innovative team at Nohoval and you can taste why it won a surprise overall gold at Blas. Both ciders are vegan and coeliac friendly and each should go well with food. Thinking of a salad in the garden with a bottle of the Apple and Cucumber while the Rós should be ideal with the strawberries. Must set that one up while the sun is out! Stockists for both ciders: Bradley’s Cork; 1601 Kinsale; Blackrock Cellar, Co. Dublin; Gibney’s of Malahide, Co. Dublin; No 21 Lismore, Co.Waterford; Paddy Blues, Gorey, Co. Wexford; Redmond’s of Ranelagh, Dublin; Lilac Wines, Dublin 3; Supervalu Kinsale and Clonakilty; Riney’s Bar, Sneem, Co.Kerry. Matson’s Wine Store, Grange and Bandon, Cork. Ardkeen, Co. Waterford; Beacon, Dublin; City West, Dublin; Blanchardstown, Dublin; Douglas Court, Cork; Dun Laoghaire, Dublin; Glasnevin, Dublin; Malahide, Dublin; Naas, Kildare; Rathgar, Dublin; Rathmines, Dublin; Templeogue Village, Dublin. Isn’t the Inchydoney Island Lodge and Spa one of the best situated hotels in the country? One of the most welcoming too! Can’t recall any other greeting me (and every guest) at reception with a glass of the excellent (and local) Stonewell Tawny. And when you leave, well there is a pot (a very tasty one too) of their own Winter-Berry Jam. So now add in a wine dinner with the renowned Maison Louis Jadot and you can understand I was in a foodie heaven. The weather didn’t exactly cooperate (it was about 12 hours behind schedule!) so the event didn't quite live up to the Burgundy on the Beach title but it was top class in every aspect. The beach-side hotel, miles of sand to each side, supports quite a few local producers and a few were featured in the five course menu. But I spotted many also in the ancillary menus: Kids, Sandwiches, Room Service, and Afternoon Tea. 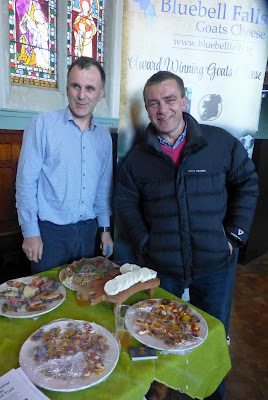 Some of those included were: Clonakilty Pork, Bushby Strawberries, cheesemakers (Coolea, Cashel Blue, and Bandon Vale), Timoleague Ham, Ummera Smokehouse, and Shannonvale Chicken. Breakfast is also quite an occasion, some great choices on the menu (hot and cold) and lovely service in a smashing room. 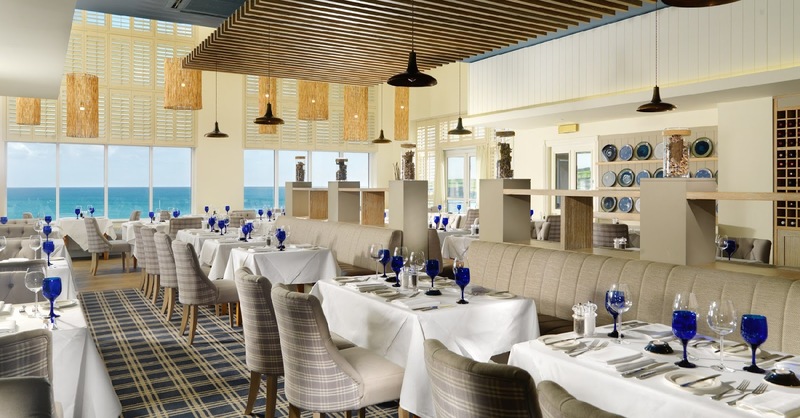 And that Gulfstream Restaurant, with its windows looking down on the Atlantic, was also the venue for the Wine Tasting Dinner at which I was an invitee. The guests met in the superb lounge and we were welcomed with some tasty canapés and a cool glass of Chablis, by Louis Jadot bien sur. This bright and fresh wine was just the ticket to get the evening off to an excellent start, the canapés vanishing and the chats starting. Marie-Pierre Dardouillet (left), Export Director with Maison Louis Jadot, supported by distributors Findlater's, was introduced in the restaurant before dinner. 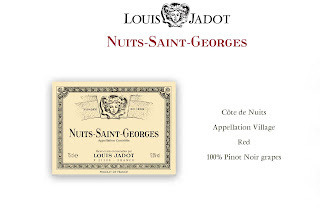 And, not wanting to interfere with the flow of the dinner, spoke about the three white wines, produced by Jadot from their 250 hectares of vineyard. The Chablis comes from the northern part of Burgundy, somewhat cooler than the second wine, the fresh and fruity Saint-Véran. This comes from a small village in the Maconnais region, “nice to compare the two, side by side”. Both are produced from Chardonnay. Generally, white wines from here are Chardonnay, reds are Pinot Noir. Soon we would “meet” the third white, the Meursault, another 100 per cent Chardonnay. This is fermented in wooden barrels and aged 15 months before bottling. “well balanced oakiness, much more complex and deep,” said Marie-Pierre. A beautiful wine, full-fruited bouquet, generous palate and a long finish and a terrific match with the Gulfstream Seafood Assiette. Now too sure which I was most looking forward to try: the fillet of Macroom beef or the Nuits-Saint-George. The wine is one of the region’s most famous wines, aged in oak barrels for 12 months, deep of colour and flavour. Marie-Pierre: “Lots of structure, tannin. Elegant.” Mais oui! For our final wine, we moved south from Burgundy to Beaujolais next door and that meant a change of grape from the Pinot Noir of the Nuits-Saint-George to the Gamay. As you might expect, it wasn't any old Gamay (Beaujolais nouveau for instance is a Gamay) but a cru. There are ten crus in Beaujolais and Moulin-a-Vent (Windmill) was where our wine was produced. “The Gamay thrives on the granite soil and this spends 12 months in barrel. 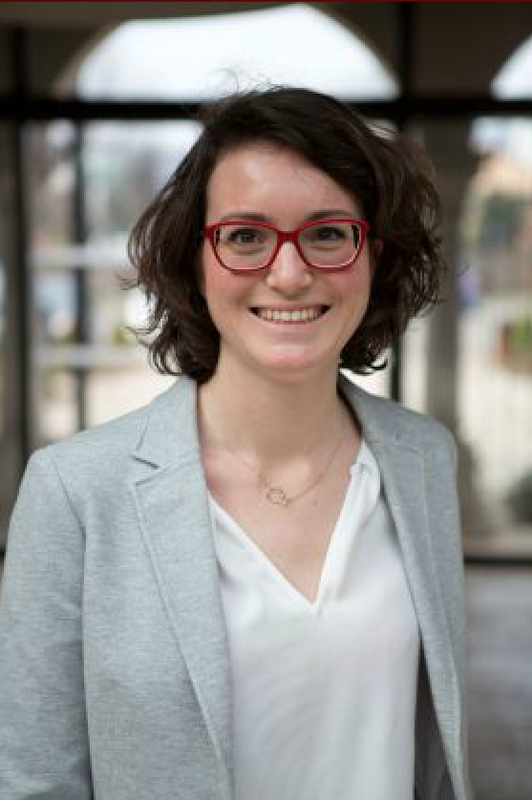 It is much more fruit driven and will be interesting with dessert!”, said Maire-Pierre. Probably not the best match but a lovely wine that I more or less held back until my plate was cleared. 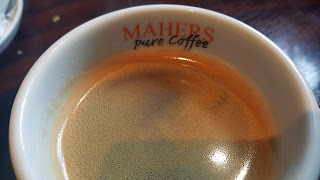 Then I enjoyed it and its reviving acidity all the more! And those plates. Thanks to Head Chef Adam Medcalf and his crew, they looked splendid from start to finish. 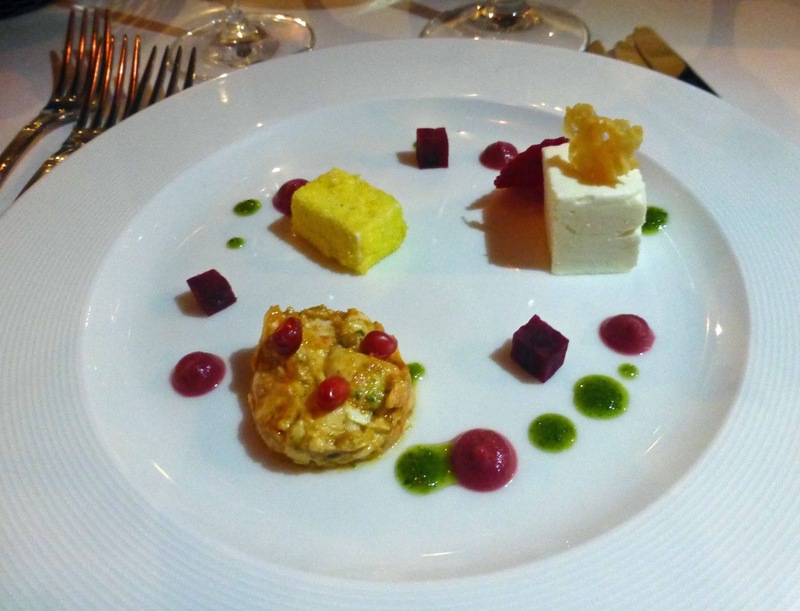 The starter was Macroom Buffalo Cheese Plate: crisp Feta and polenta, Ricotta pannacotta, Mozzarella and Tomato Tian with beetroot, sun-dried tomato and rocket. 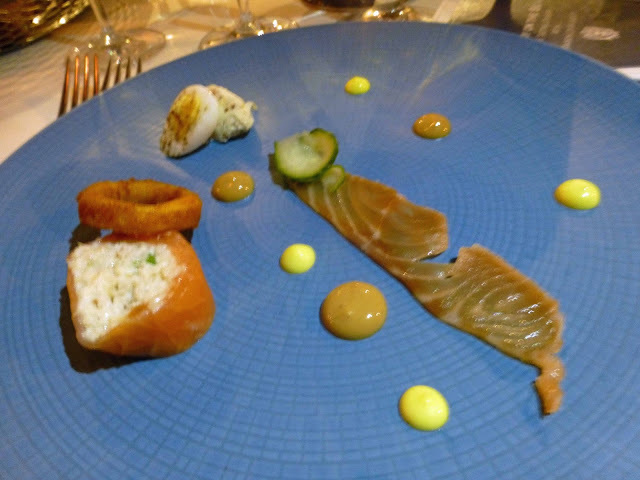 The fish course was entitled Gulfstream Seafood Assiette and consisted of Ummera Smoked Salmon and crab roulade, sugar cubed salmon, crisp fried squid with a celeriac remoulade, pickled cucumber, quail egg and a bisque reduction. 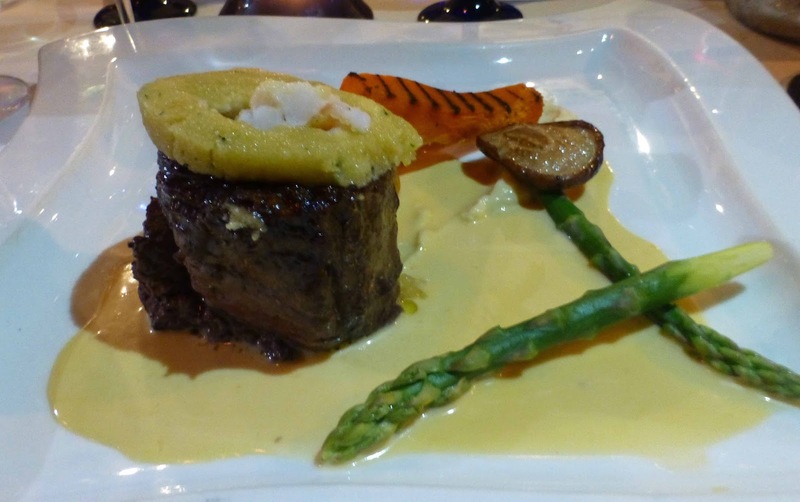 The came the Roasted Fillet of Macroom Beef with a lobster and prawn crust, fondant potato, celeriac purée, shiitake mushroom and a horseradish cream sauce. 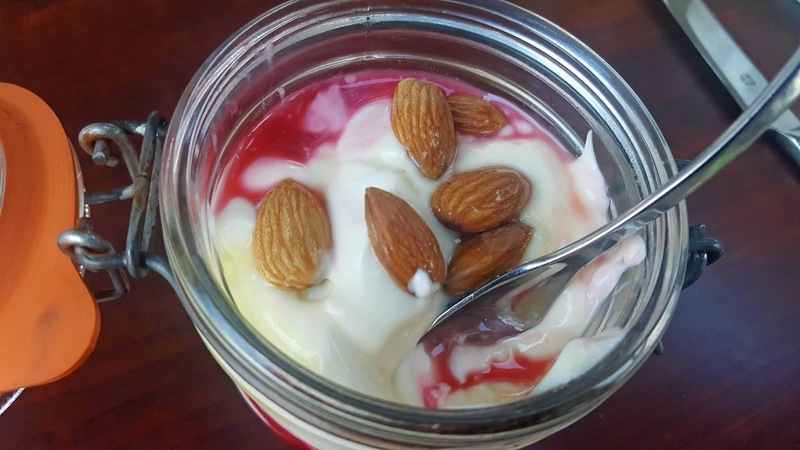 Time then for dessert: Roasted Rhubarb and orange pannacotta with ginger biscuit Ice-cream. The lovely evening was drawing to a conclusion but Ruth McCarthy, Director of Sales & Marketing at Inchydoney Island Lodge & Spa, cheered the guests up with a promise of “many more evenings like this”. Marie-Pierre complimented the hotel kitchen saying the food was "very good". 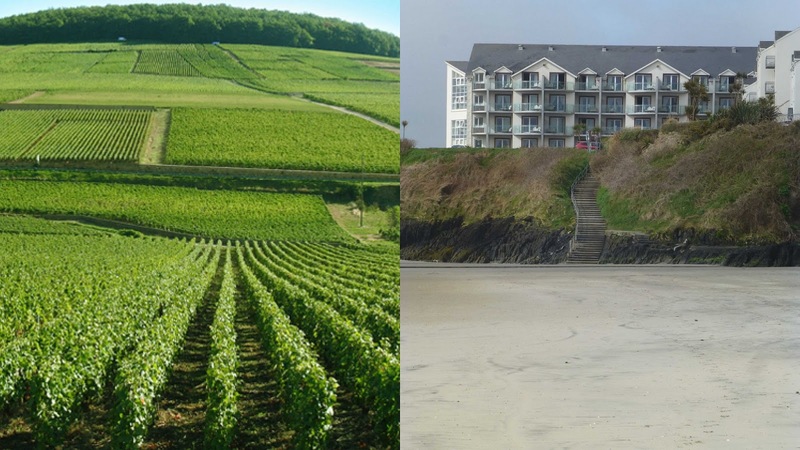 “Hope you enjoyed the wines and see you in Burgundy.” Inchydoney on tour. Now who’s organising that trip. Syrian Food at Bandon's Bayleaf. Farmgate Café. Traditional. Seasonal. Regional. Food of the land and work of local hands. Farmgate Café. Traditional. Seasonal. Regional. Food of the land and work of local hands. Irish stew. Bacon and Cabbage. 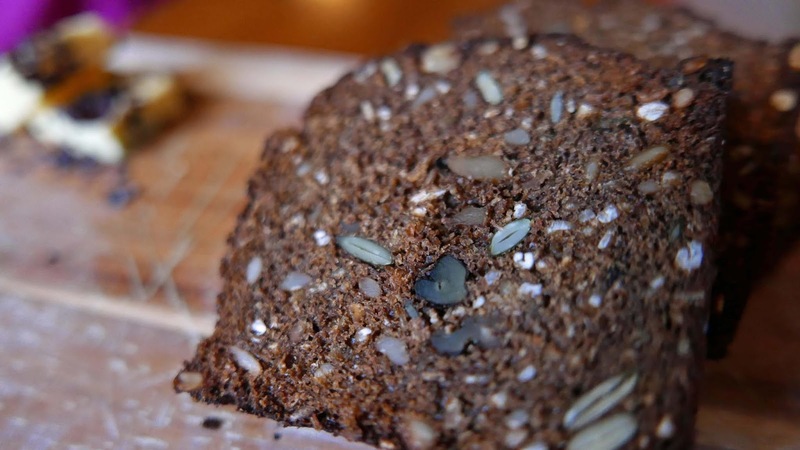 Just the mention of these traditional Irish dishes can get some modern “foodies”, some chefs too, on their high horses. They don’t want us posting pictures of our peasant food on the internet, preferring instead those “decorated” with colourful drops from a squeegee bottle. I like my stew, like my bacon and cabbage. Just as the French like their hardly photogenic Coq au vin. 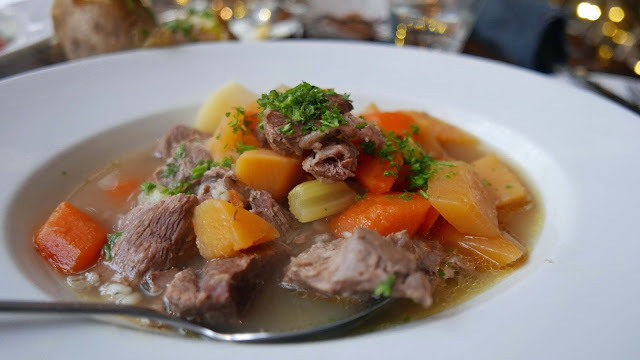 And when I saw the lamb stew on the menu during last Saturday's visit to The Farmgate, above the English Market, I had no hesitation in ordering it. It was a cold day and the warming stew was the ideal comfort food. And reasonable photogenic as well. The popular Farmgate is divided into two sections, as you may know. 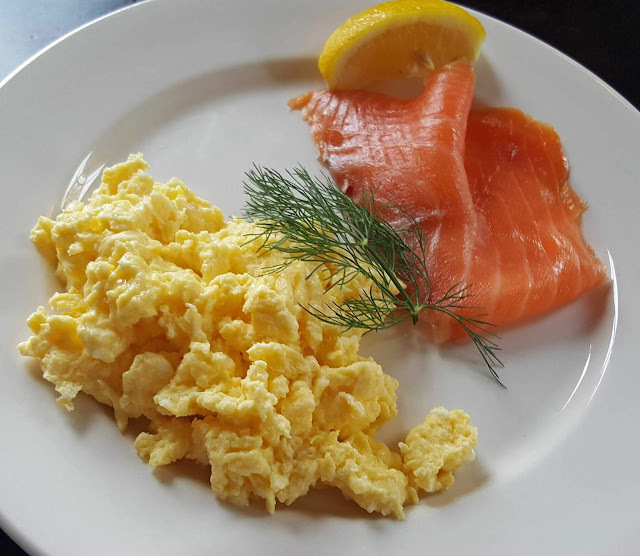 You may well need to book to get a table in the Dining Room while most of the rest of the mezzanine, the Balcony, is informal so you just queue and order and the order, if not self-service, will be delivered to your table. We had booked and were lucky to get a table in an outdoor room adjoining the Dining Room. We were told it would be cold but no problem. There are glass panels up to head height (where you sit), heaters overhead and, just in case, blankets! No need for the blankets though as we ordered from the regular list. There are always at least three daily specials: meat, fish and tart. The Lamb and Potato stew (€14.00, a euro less on the balcony) has regular company in Chargrilled Chicken, Traditional Pork Sausages with lentils, a Cured Fish plate, a Market Mezze, and a Warm Salad of free range chicken. Traditional yes but not hidebound by the past either. In any case, that Lamb stew was delicious, the meat flavoursome and tender, the vegetables spot-on, and the potatoes were perfect. And here you’ll have no problem enjoying the last of the tasty liquid as, in addition to knife and fork, they also provide a spoon. 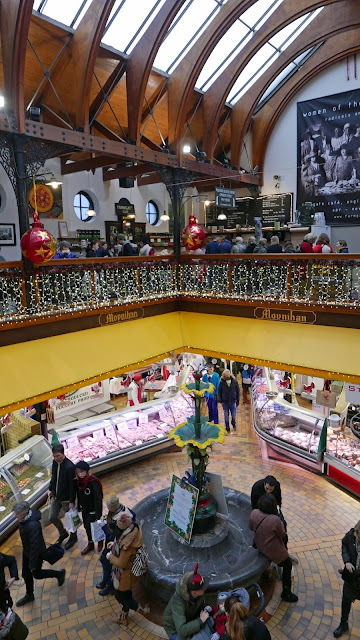 This was peak lunchtime on Saturday yet the staff, in their smart seasonal clothing, were excellent, very helpful all the way through. I’d finish up also with a traditional touch. Had been swaying between the Christmas Pudding and the Mince Pie (3.50). The Brandy Cream swung it for the Pie which had a nice layer of crumble on top. CL wanted to experiment so she went for the non-traditional Salted Caramel Confit Banana with Rum and Raisin Ice-cream (5.00). A brave woman to take on the ice-cream but it was a seriously delicious finish. 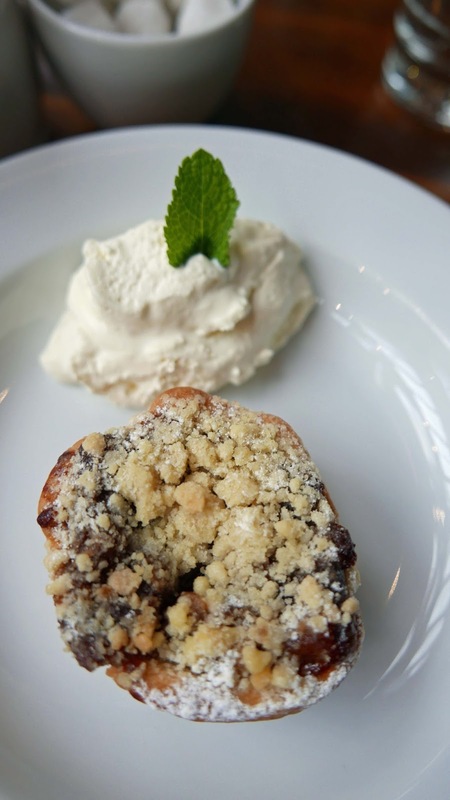 The Farmgate believes in supporting local food. And local drink too. 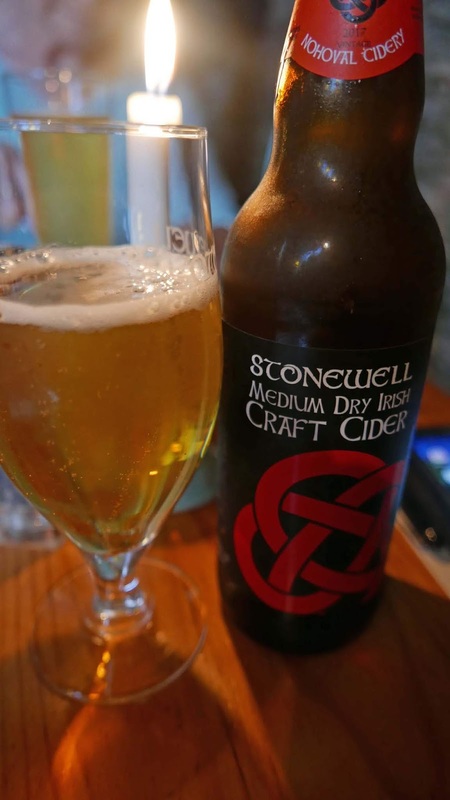 Ciders come from Longueville House and Stonewell, beers from Eight Degrees and Dungarvan Brewing, while the wines are all European. We had been taking the odd peek down to the floor of the market and, after settling up, we joined the crowd down on the floor. Eventually we had a stroll through Glow and then visited Christmas markets in St Peter’s and The Franciscan Well (this is on again next Saturday). 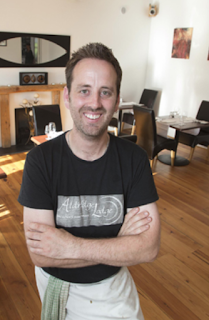 Following last year’s success, Taste Cork Week returns next month. Indeed, it will run for more than a week with an extension that takes it up to the eve of the Jazz Weekend. At the launch last week, in Nano Nagle Place, the spanking new major attraction right in the heart of the city, Ernest Cantillon of Festival Cork told us to watch out for some of the more informal events: jazz cafes, a distillery visit in a barn, and pop ups in unusual places. One or more of those pop ups will be in the café in the peaceful gardens of Nano Nagle. Keep an eye on the Taste Cork website here for more details of all events. Evenings with guest chefs always seem to be popular. One of the highlights from last year was in Isaac’s when Arun Kapil, founder of award-winning spice company Green Saffron, Chef Patron Canice Sharkey along with restaurant co-owners Michael and Catherine Ryan, hosted an exclusive sold-out spice pop-up at the Cork city institution in McCurtain Street. Holy Smoke are one of the first up this year with an invite “to embark on a unique gourmet journey and experience the best of Irish BBQ cuisine, prepared with the local meat that is cooked in Holy Smoke’s signature barbecue-style, low-n-slow, for four to sixteen hours”. Pitmasters John Relihan and Decky Walsh will serve up an exquisite six-course meal on October 17th and will walk you through the secrets and preparation techniques behind each dish while Caroline Hennessy will masterfully guide you through the pairing of each dish, presenting and explaining the corresponding whiskey or craft beer. Justin Green, and Bertha’s Revenge of course, were at the launch. And Justin has an event lined up at Ballyvolane House. It will kick-off at 12 noon (October 18th) with a B&T (Bertha & Tonic) and as soon as everyone has arrived, guests will be given a tour of the house, gardens and gin distillery. Lunch will be served at 1pm in the dining terrace where guests can meet and chat with the makers over lunch. Stonewell Cider and Eight Degrees Brewing will also be involved and tipples produced by all three makers will be served during lunch. So there you are, a nice trip to the countryside. 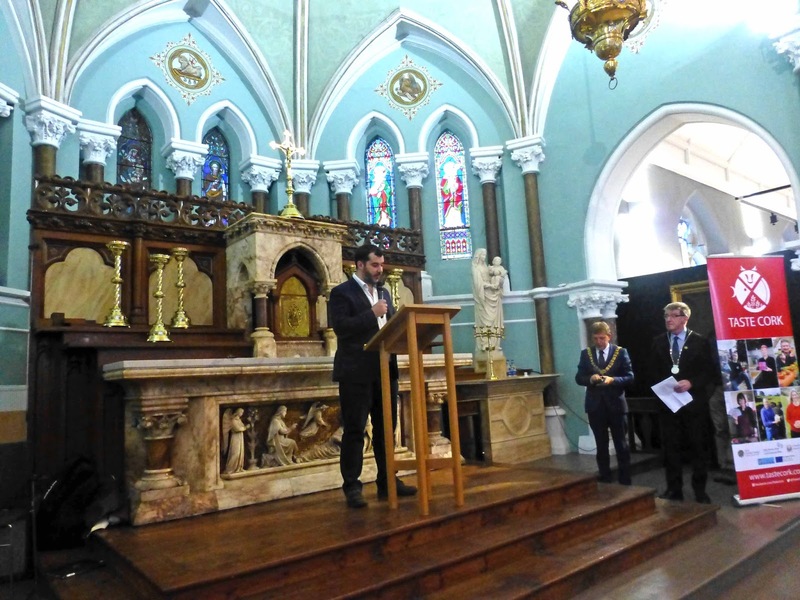 As Ernest Cantillon said in his address the event is designed to bring city and county together and indeed both were officially represented on the night. Lord Mayor Tony Fitzgerald pointed to the fact that Cork has been designated as a Healthy City and put that down largely to the good food in the area. He stressed the importance of festivals in drawing visitors and said he was very proud of what Ernest and his colleagues are doing. Ian Doyle, Deputy County Mayor, rightly congratulated the City Council on the marvellous work that they have done (and are continuing to do) at Nano Nagle Place, “a fantastic venue”. He noted that artisan food and drink are becoming very important and praised the great dedication shown by the producers. Shane Clarke, of Nano Nagle Place, gave us a brief rundown of the life of Nano Nagle and of the current project and said there had been some 250 years of education on the site, an element they intend to take forward. And he too mentioned their lovely cafe and is looking forward to the pop-ups during the festival. The Nano Nagle has just recently opened and is well worth a visit. Details here. As is usual with Taste Cork, there were quite a few producers in Nano Nagle: Cider from Stonewell and Longueville, spirits from Bertha’s Revenge, Kinsale and St Patrick’s, Kinsale Bay and the Fish Deli (great to meet up again with Monica and Peter), Bluebell Falls, Hassett’s, On the Pigs Back, and Ballymaloe Relish. And the Old Butter Roads Food Trail had a lovely tasting plate. Well done to all for turning up and adding to the occasion.